my little "Pippy Longstockings" is growing up way too fast. I love the way that she is really getting into writing and expressing her creativity. Her "Valentine Purse" shows you just what I mean. 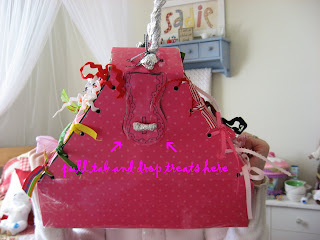 I had the box and mentioned the purse idea... and the rest was Sadie's cute and creative spin. I guess I helped a little with the latch-handle part. She can hardly wait to take it to school. dont you feel the beat? I'm sure Sadie is growing up to be super talented like her Mom. XOXO. WOW Like mother like daughter!!!! You are teaching her well!!!! Love that purse< Your kids are so lucky to have you!